[after robbing two men of their clothes] Thank you, gentlemen! Someday, I will repay you. 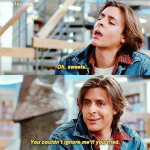 Unless, of course, I can't find you or if I forget. Shrek 2 is a 2004 animated film sequel to the previous film Shrek in which Princess Fiona's parents invite her and Shrek to dinner to celebrate her marriage, not knowing that the newlyweds are both ogres. 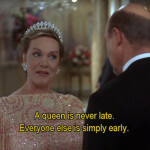 A queen is never late.Everyone else is simply early.